I was totally skeeved out. A bird. A big bird. A big DEAD bird. On my back porch. There it lay. For days on end. While Hubby and I played that passive-aggressive couples game. Hello? I certainly wasn't about to remove the thing. That obviously falls into his realm of home maintenance. Except Hubby was being lazy/squeamish/annoying (you choose). Poor Mr. Bird needed a proper resting place. So one day I got PMS totally aggravated and decided to move the thing myself. I grabbed a shovel from the shed and scooped up the bird corpse and threw it into the woods. And then left the shovel on the back deck. On purpose. Heh. Another dead bird. What the heck is going on?! And more importantly: When is Bird Corpse #2 going to be removed from the back deck (by Hubby)? And how long will it take (him)? Birds don't get glass, streaked or no. But LOL about the clean-up war! It's the same bird. I put it back on the deck to annoy Viz. Sorry to get you involved. 10 days minimum. Could be longer. For about a month I found a dead bird 10 days in a row! (different bird every day) Then it stopped. I assume the birds were having some sort of turf/tree war! oh dude. that's not cool. the dead birds or the couples game. hoping you win the next round. We've had four 40 lb. bags of now-hardened cement in my side yard since the spring. Stay strong, my sistah! And my word verification is LOUSE. Heh. oh, man. i'm afraid now that you removed bird #1, that might ace him out of having to remove bird #2. they think like that...once you show them you CAN do something, they seem to think you WILL. Maybe you are getting more reflection on the glass now that the leaves are not blocking the sun? I had a bird fly into mine and live. I spent a few hours finding a place I could take it too, capturing it, driving an hour to get there, but it didn't survive. It turns out it was a rare yellow-billed cuckoo bird. The bird sanctuary woman said to put ribbons up at the window (outside) because the movement keeps the birds away. Removing dead animals is totally a boy job. Your windows must be really, really clean for so many birds to try to fly into them. O.M.G. Barf barf barf barf barf... I can't believe you cleaned up the first one.... that's insane! It will take about 2 weeks. That is how long it takes in my house when our cat leaves little gifts on your front porch. But the secret is to tell your hubby that the kids are playing with it. Then he will move it. Works every time in my house. Very funny - reminds me of an everybody loves Ramond episode where they were refusing to take care of luggage because they thought it was the other's job. 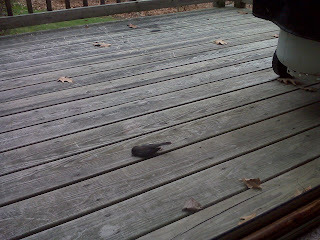 You must be keeping your glass doors WAY too clean......I sure as heck have never had a bird fly into my dirty windows! This post is giving me the willies... my husband would never have removed it. That would skeeve him out to no end. I would have called a brother. I hope that's the last. Eeek! At least it wasn't an owl. I had a friend who had that happened. The glass had to be replaced! Hope the hubby takes care of it soon. Have a great weekend. This has happened to us before. But nothing tops the summer morning my little sister ran smack dab into our sliding glass door. And she was a lot bigger than a bird! Little sis recovered to tell the tale, which we relate again and again, usually around Christmastime! SITS sent me by, and I'm glad they did...Happy Saturday Sharefest! Yuck! We've had that happen too-freaks the kids out. My husband would move it because it would gross him out, but I did have to help his mom move a dead skunk from under a bush at her house because he didn't help her do it and I got tired of listening to her-that was nasty! !